Mangaluru, Dec 08 2017: While it is just about 15 minutes cruise from Mangaluru to Talapady for vehicles bound for Kasaragod and other parts of Kerala on National Highway 66, drivers have to spend several minutes at the Talapady Toll Plaza to move on. 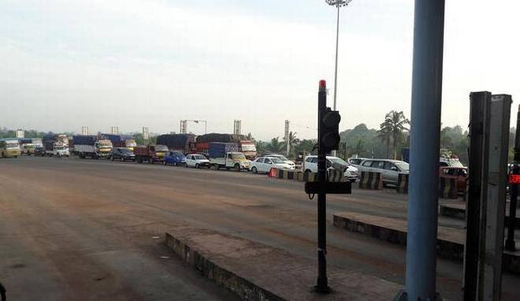 During Dec 7, Thursday morning peak hours, hundreds of Kerala -bound vehicles were seen lined up in front of the toll plaza, even as just two of the four plaza gates were seen working. Many of the drivers after losing patience began honking thereby making things worse. “This has been a regular occurrence,” lamented Kumar, who was driving a pick-up van. He said the Navayuga Udupi Tollway Pvt., Ltd., does not deploy adequate number of personnel ostensibly to save on costs thereby causing inconvenience to road users. NHAI Project Director Z. Samson Vijay Kumar said the authority has made adequate provisions for gates at the plaza. The concessionaire has failed to deploy required number of personnel, he said and added notice would be issued to the concessionaire.